Bird-of-paradise plants are native to southern Africa, where they grow unhindered in sub-tropical areas. The plants can form astounding masses outdoors in southern Florida or southern California. They are stunning as 3- to 5-foot tall houseplants in cooler locations. Growers may encounter similar types of problems with bird-of-paradise in any setting, indoors or out. Bird-of-paradise plants are slow-growing, so a simple remedy may take months to show results. Bird-of-paradise leaves are huge, measuring up to 18 inches long and 6 inches wide. The remarkable foliage is part of the beauty of the plant. Occasionally leaves may turn yellow, then brown. Trim off yellow leaves; they will not recover. The cause for yellowing may be over-watering or under-watering. Bird-of-paradise needs consistently moist soil. Good drainage is imperative. Soil should be rich loam, airy and light enough to allow water to filter through easily. Never allow the roots to stand in water. Frequent, even daily watering is best during the summer growing season. A saucer under potted plants will catch excess water. In the winter, water plants when the soil surface becomes dry. Young bird-of-paradise plants expend energy on rhizome, root and foliage development. A plant from seed usually will not bloom before four or five years of age. A divided plant blooms in two or three years, depending on its new surroundings. Pot-bound plants produce more and larger flowers. Repotting a bird-of-paradise will interrupt or delay flowering for up to two years. New plants that have arisen from rhizomes in established beds may bloom sooner. Perfectly healthy new plants may take up to 10 years to produce a first bloom. Insufficient light is another reason for a lack of blooms. 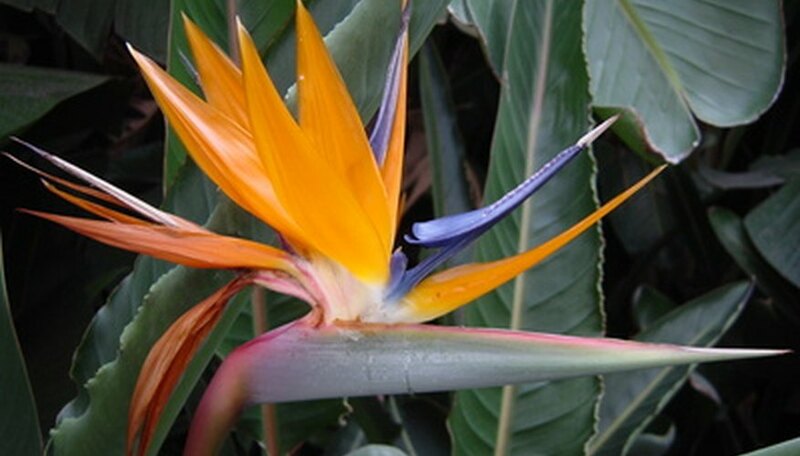 The equivalent of full sun is required for bird-of-paradise plants to produce flowers. Supplemental plant lighting may help with indoor bird-of-paradise plants. Bird-of-paradise plants are not frost- or freeze-tolerant. A frost will kill the above-ground plant, but as long as the ground does not freeze, the plant should recover. Trim back a plant damaged by cold to remove all dead and dying matter. Bird-of-paradise plants that are grown outdoors will sucker, sometimes to the point of being a nuisance. A mature bird-of-paradise may have a very extensive root and rhizome system, and it can be strong enough to crack shallow walls and sidewalks. In outdoor settings, plant bird-of-paradise at least 6 feet from a building foundation or ornamental structure. Potted bird-of-paradise plants may crack the pots when they are root-bound.